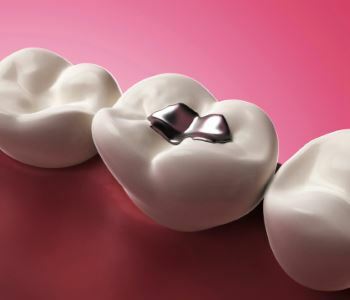 Dental amalgam is often called by the innocent-sounding name of “silver.” In fact, that refers to the colour, not the type of metal. Amalgam is an alloy, made of about 50 percent mercury and a mixture of metals. Many patients say they were unaware of this fact when their fillings were placed, and now they want the amalgam removed. Others object to the colour, which tends to blacken over time. It is possible to remove these fillings safely and effectively, but a specific protocol is needed. Our practice is mercury free, which means that we do not use amalgam or any other product containing mercury. We also offer mercury safe dentistry, which refers to the specific technique used for amalgam filling removal. This is important because heat causes amalgam to release mercury vapour. As you probably know, the traditional method of drilling out a filling causes considerable heat. It also causes dust, fine particles which the patient may inhale or swallow. Unfortunately, this very technique is used around the world, so patients must be vigilant when choosing a dentist. We are a proud member of IAOMT, and adhere to the protocols and methodology that they have developed. To begin with, a different technique is used. Rather than grinding with a drill, the filling is removed in as few pieces as possible and steps are taken to keep the working temperature low. This reduces the amount of vapour and particulate matter that is released, but does not eliminate it. Therefore, measures are taken to protect the patient and dental staff. Suction is used to capture particulates and vapour, while advanced filtering prevents them from re-entering the air. Protective physical barriers prevent the absorption of mercury through skin contact, and keep it from entering your throat to be subsequently swallowed. A supplemental oxygen supply is used to ensure that you breathe clean, pure oxygen while the amalgam is removed. Once the filling is removed, we will replace it with a beautiful, metal-free, and more compatible filling, crown, or other restoration. If you want to get the amalgam out of your mouth safely, call us at and arrange an appointment. We have two state of the art offices, conveniently accessible throughout Melbourne and surrounding communities. Please call 03 8001 6021 to reach our Sunbury office, or 03 8400 4104 to reach our Moonee Ponds office.